New Delhi: Ispat Industries Ltd, the country’s worst performing steel stock, may cut as much as 40% of its production as demand slumps from Ashok Leyland Ltd and Tata Motors Ltd, the nation’s biggest makers of trucks and buses. Ispat joins domestic rival JSW Steel Ltd in slashing output as consumers delay purchases of homes and cars, driving down steel demand and prices. ArcelorMittal, the world’s largest steel maker, had said earlier this month it will slash its global production by at least 30%. “If the slowdown in the auto and infrastructure sectors continues, there will be further production cuts," Ispat’s Mittal said on Monday in an interview at the World Economic Forum’s India Economic Summit in New Delhi. “This is a situation nobody had foreseen." Tata Motors, India’s biggest truck maker, shut its Jamshedpur plant from 6 to 8 October and its Lucknow factory from 10 to 15 November. It will also halt commercial vehicle production at its factory in Pune from 21 to 26 November, according to a company statement last week. Ashok Leyland, the nation’s second biggest commercial vehicle maker, had said earlier this month that its plants will work on a three-day schedule for the next two months because of falling demand. India should impose a tax on steel imports as cheap purchases from countries, including China, have eroded the margins of local steel makers, Ispat’s Mittal said. 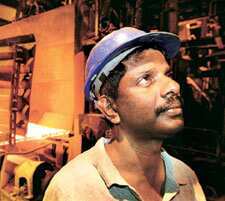 Steel imported from China was cheaper by about Rs9,000 a tonne in the Indian market, he said. Demand for steel may revive from January and Ispat expects the three months till March to be “positive" because of falling costs of raw materials such as iron ore and coal, Mittal said. Ispat Industries’ shares fell as much as 6.6% before recovering marginally to close at Rs10.87, down 4.31% from their previous close, in Mumbai on Monday. The stock has plunged 87% this year, compared with a 77% drop in the metal index of the Bombay Stock Exchange.